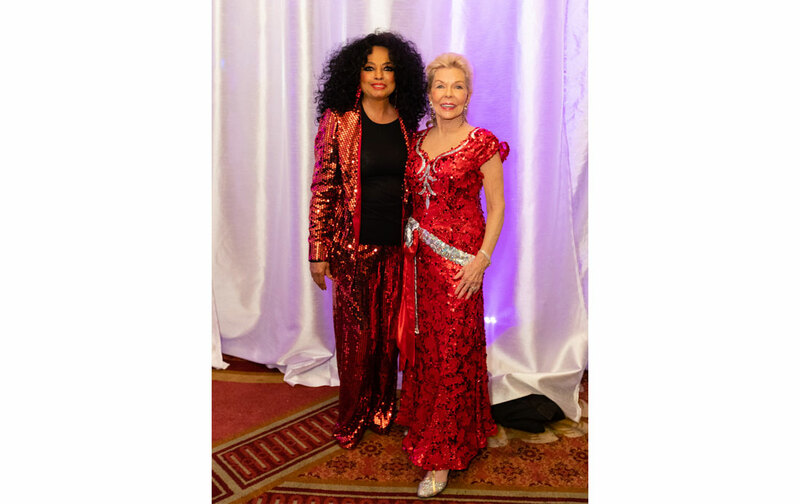 Palm Beach, FL – A record attendance of nearly 700 people filled the dance floor – and, in fact, all open parts of the entire Ponce de Leon Ballroom floor – singing and swaying as the legendary Rock and Roll Hall of Fame singer Diana Ross performed some of her greatest hits. A little while later, the same capacity crowd was rolling in their seats with laughter as Las Vegas superstar comedian Rita Rudner delivered side-splitting one-liner after one-liner. And then everyone was back on their feet dancing the night away to the tunes of the Danny Beck Band. All this, and more, helped make the 25th Silver Jubilee Lady in Red Gala sponsored by Lois Pope and LIFE, Leaders in Furthering Education, on Friday, January 4, 2019 at The Breakers “one Supremely Golden affair,” exclaimed Mrs. Pope, who created the gala and served as the evening’s host. And speaking of “Wow,” the event raised more than $1 million and benefitted disabled veterans through the “Pups4Patriots” program at the Lois Pope LIFE Center for Military Affairs at American Humane. This unique program takes dogs languishing in shelters and provides them with special training so that they can be partnered free of charge with disabled veterans as therapy dogs. Over the past 25 years, the Lady in Red gala – traditionally one of the highlights of the Palm Beach social and philanthropic season — has resulted in other historic achievements, including the building of the American Veterans Disabled for Life Memorial, the nation’s first and only permanent public tribute to the more than four million living disabled American veterans and all those who died. Among their many other accomplishments, Mrs. Pope and LIFE have also sent more than 25,000 disadvantaged Florida children to summer camp; provided college scholarships to young men and women seeking to pursue careers in public health; built a clean water system in a Guatemalan village destroyed by a hurricane; provided the means for Sudanese women to flee genocide; donated three tractor-trailers for American Humane’s Red Star Rescue program that shelters and provides medical treatment to dogs, cats and other animals lost, abandoned or displaced by natural disasters and severe abuse situations; created the Lois Pope LIFE Center at the University of Miami Miller School of Medicine to house the Miami Project/Buoniconti Fund to Cure Paralysis, the world’s leading center for paralysis research; championed the designation of October 5 to be an annual National Day of Honor for disabled veterans; and advocated for national legislation that enables military dogs to be brought home from the front lines and then reunited with their human service member handlers. Most recently, Mrs. Pope made another history-making gift – the largest ever to the Bascom Palmer Eye Institute to establish the Lois Pope Center for Retinal & Macular Degeneration Research at the Institute’s Palm Beach Gardens campus. So there was much to celebrate at this year’s Lady in Red. And what a celebration it was – from the entertainment to the food to the decorations. When guests arrived for cocktails, they were serenaded by the Palm Beach Symphony in The Breakers’ Venetian Room. In keeping with the Lady in Red theme, the room was decorated in red. Then guests moved into the Ponce de Leon Ballroom, which highlighted the Silver Jubilee theme and was adorned with white flowers accented with silver and gold. The event’s Grand Honorary Chair was Christine Lynn and Honorary Chair was Candy Spelling. Champion Humanitarian Chairs were Janet & J.J. Cafaro; Jan and Chip Malley; Katarina and Robert Miller; and Suzie Sayfie. Chairs were Lois Pope, Dr. Robin Ganzert; Bjaye and Frank Pilotte, and Gail Worth and Frank Orenstein. Co-Chairs were Linda and Al Adelson, Holly and David Dreman, Wendy and Gary Roberts, and Florence Seiler and Bill McBride. Inspirational Chairs were Maude Cook, Suzi Goldsmith, and Mary Ann and Walt Schwenk. Leadership Chairs were Dr. Peter and Simone Bonutti, Terry Ebert Mendozza, and Erika Rizzuto. And Entertainment Chair was Sunny Sessa. Corporate Sponsors were Ambassador Realty Corp., Cooper Street Cookies, Netjets, Tiffany & Co., Wells Fargo Advisors, and the Gladys & Sy Ziv Foundation, Richard S. Kochman, president. Will and Anthony Nunziata, the super-popular twin songsters, served as auctioneers, offering up exclusive items from Tiffany & Co. and exotic vacation locales during the live auction.